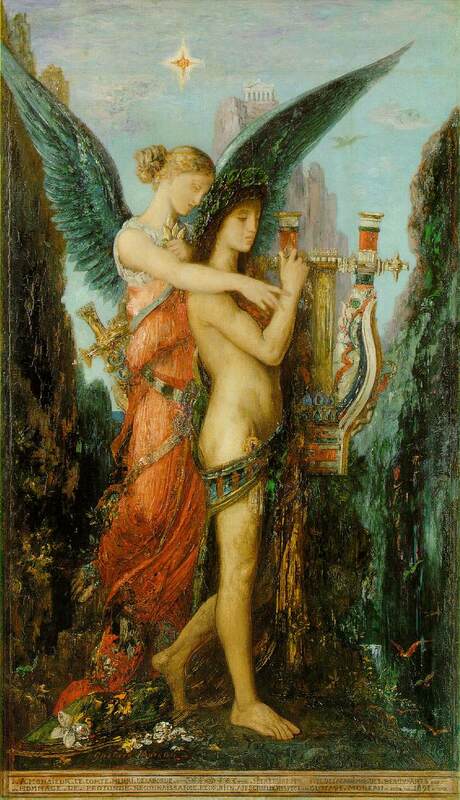 Gustave Moreau, Hesiod and the Muse, 1891. The world is a Silk Road--we have been adopting and adapting bits of other people's culture from the start. Culture is no more a static thing than is language. It's a living, growing thing, and we should hope that it is in good health for all our sakes. What many froth over--cultural influence--is the condition of the planet for many thousands of years. Cultural contact meant and still means change and growth and a way of re-imagining one's own arts. At the moment, I don't think the culture is in especially fit health, in large part because we've cheerfully let in the Trojan horse of entertainment (enjoyable and fun and occasionally rising to heights, yes, but not usually the height of human achievement) to defeat the high works of culture and leave only tiny audiences for many of our most important arts. Precious traditions dwindle and die away. Take poetry as an example. We find ourselves--at least in this country--with a vision of poetry that is extremely small these days. As readers and as writers, we have forgotten our Western classical roots, seldom study the great works of the past in our own language (we oust Chaucer and Shakespeare and Milton from the English major in many schools), and have abandoned our knowledge of a range of forms, prosody, syntax, modes, tropes, figures, and auricular pleasures. And that means we have kicked a good deal of variety and surprise and liveliness out of the poetry tent. A great many writers have come through the Romantic period and into Modernism and Post-Modernism with a conviction that poetry can only begin with our own (sometimes itty-bitty) feelings and end in an epiphany of some sort, and that stance cripples us. We have been devoted to the small lyric for too many years, and we have ignored the other possibilities. When such things happen, we fall into the world of diminishing returns. ...the poet aims to restore to poetry the universality and aboriginally that over time has mistakenly been reassigned to prose. Poetry is the preconditional state of language, not its late and shiftless offspring... Poetry was once the queen of literature, not its poor cousin. At various junctures drama was written in it; so were letters. Once the medium of songs as of satire, of philosophical meditations and allegory, of civic as well as private praise and lament, poetic verse periodically could do anything a thoughtful or unruly bard wished it to do. It was the very expanse of possibility in which literary structure was secured. I subscribe to the notion that, if language can be thought of as a pyramid, its base is poetry, not prose. Poetry is the ground--the ground of resemblance, controlled in time--from which literature of all kinds takes shape. Isn't it time for a revolt of the Muses? My hope is that we are entering a period of unruly bards who will take new territory and unruly readers, who will look far beyond the limits of entertainment. We ourselves are, after all, the ones who can change our world. The past and tradition don't just make us look backward but are the nourishment that helps us look forward. Here are some thoughts about the state of poetry and the arts from writer and poet Jeff Sypeck, drawn from a series of comments on the previous post, "The Fool in his fish skin cloak," that I thought deserved to be in greater light and not tucked away in the comments section. And it's not just at universities. I spent two years attending major conferences in the museum world, and everyone was fretting about how to meet the demands of young people, with almost nobody willing to claim that their field should be promoting slow-paced contemplation and beauty as an alternative to the culture. I've seen museums use their exhibition spaces as dance clubs, and some symphonies now make a big deal out of programs devoted to movie soundtracks or video-game music. I don't necessarily object to any of those things, but you can smell the nervous sweat of arts professionals desperate to be liked by the culture at large, even though the culture has overwhelmingly opted to embrace corporate entertainment instead. Museums, art centers, indy publishers, orchestras--they should all be starting with the premise that for at least some people out there, alternatives exist to a $410 million piece of crap like "Batman vs. Superman," and I don't mean "Batman vs. Superman II." What can we do? I, for one, am trying to promote and spend more money on art and entertainment that's weird, independent, unaffiliated--but I think it would help if we had stronger rebuttals to cries of "elitism!" and "snobbery!," the most common smears against fine-art and high-arts advocates. People who like crap aren't open to hearing someone scold them to like better things--but how to persuade them is something I've been thinking a great deal about lately. What we need are good arguments—not lofty statements that we ourselves already believe, but claims that persuade. To my mind, one of the best is an honest expansion of the argument used when music and theater programs in schools are threatened: that these things are lifesavers for kids who desperately need outlets. There's no reason that thinking should apply only to kids or only to school programs; I've seen middle-aged people find new purpose in their lives by learning oil painting or becoming mosaicists, and I once saw a 60-year-old student, a construction foreman, discover that he loved opera (to the bemusement of his patient wife). We should greatly expand the thinking behind the cry that sensitive kids need the drama club; all kinds of people need this stuff in all phases of their lives. Lately I've been thinking that another viable argument involves a bit of gentle shame aimed at the more liberal-minded: if you so distrust and dislike corporations, why do you give them 100 percent of your art and entertainment budget? Diversify! I should note that I write this as someone who used to be a popular-culture junkie. I still like a good superhero movie, danceable music, ambitious comics...but I'm grateful to have had bigger things to grow into. I foolishly assumed that this more high-minded culture would always be there; I never imagined that popular culture would so overwhelm it. I also think it has to be a face-to-face process: getting people into artists' studios, art centers, theaters, literary events, and so forth. I'll go so far as to say that even video-game night or sci-fi theme-song night at the orchestra could be good starts, as "pops concerts" once were, if these events were presented not apologetically, but as the first promising glimpse of a much larger creative world. So what do you think of all that? I expect there are plenty of people who have interesting ideas about how to deal with the conquest of entertainment and the need for unruly bards! If you are one, leave a note. How to care for culture is a issue that sings out to us all. Update: Lots of views, no comments! Maybe I'd better promise not to put any comments on the front page! I also ought to say that a great deal of what we once regarded as entertainment has lasted, and lasted well--Dickens, Wilkie Collins, Fielding, etc. Evidently the meaning of this word entertainment has changed over time, though, and perhaps I need to figure out what it meant and what it means now. So here's a poem with a bit of fairy glamour, the subject being the Fool's beloved, Precious Wentletrap. This one was originally in Yew Journal, and was picked up by Shirl Sazynski for her future anthology, Persephone's Kiss. Who is the Princess Wentletrap? A trout that shatters pools with light? 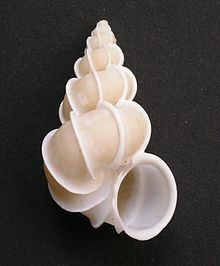 Or is she only a spiral shell? Listen. Closer. Glass bells shiver. The sea is captured in a whorl. The thimbled music of the spheres. Is she a castle’s winding stair? Dance high-wire on the horns of moon? Or is she threshed from lunar fields? Is she the bounty of the dark? Onto a strand of quartz and gold! How the Fool dreams Precious Wentletrap . . .
As her white hands, held up to light. Why manifest to the King’s Fool? He has the gift of fetching her. Under a crown of sparkling dust. If you are interested in literature and criticism, read and enjoy or tussle with Joseph Epstein's new review, Where Have All the Critics Gone? Clip: Today the standard of highbrow culture has been worn away, almost to the point of threadbareness. For political reasons, universities no longer feel obligated to spread its gospel. Western culture—dead white males and all that—with its imperialist history has long been increasingly non grata in humanities departments. Everywhere pride of place has been given to the merely interesting—the study of gay and lesbian culture, of graphic novels and comic books, and more—over the deeply significant. Culture, as it is now understood in the university and elsewhere, is largely popular culture. That battle has, at least for now, been lost. I look at Fra Angelico with a kind of relief, knowing that he would never, ever believe in "a senseless act of beauty," that beauty for him is always meaningful. So different from our own day. He's always so direct and clear and devoted to the art. Like George Herbert, he could have been much in a worldly sense but turned away from those chances. I admire that sort of understanding, one that sees so clearly what is important in life and what is not. And there we are veering closer to what you call "unfashionability as a virtue." 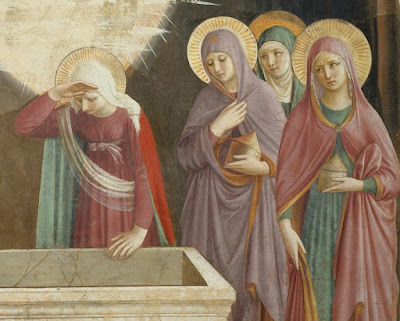 I'm too tired to think in words, so here's a little more Fra Angelico to admire--a detail from a fresco, "Resurrection of Christ and the Women at the Tomb" at the Convento di San Marco, Florence, 1440-1441. Public domain image. Here are some more beautiful San Marco images from Fra Angelico. He would not follow the ways of the world, but lived purely and holily, and was a great friend of the poor. He painted constantly, and would never represent anything but the saints. He might have been rich, but did not care about it, saying that true riches are nothing else than being content with little... To sum up, this father, who can never be enough praised, was in all his works and words most humble and modest, and in his paintings facile and devout; and the saints whom he painted have more the air and likeness of saints than those of any one else. It was his habit never to retouch or alter any of his paintings, but to leave them as they came the first time, believing, as he said, that such was the will of God. And now good night! Or good morning, elsewhere. 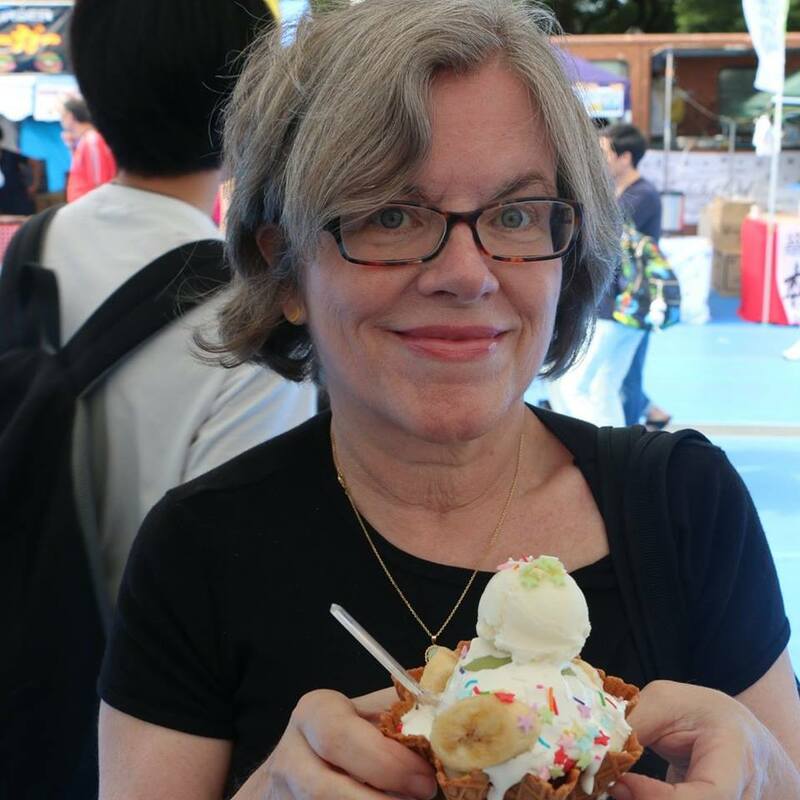 Nancy Olson, founder and 29-year owner of Quail Ridge Books of Raleigh. 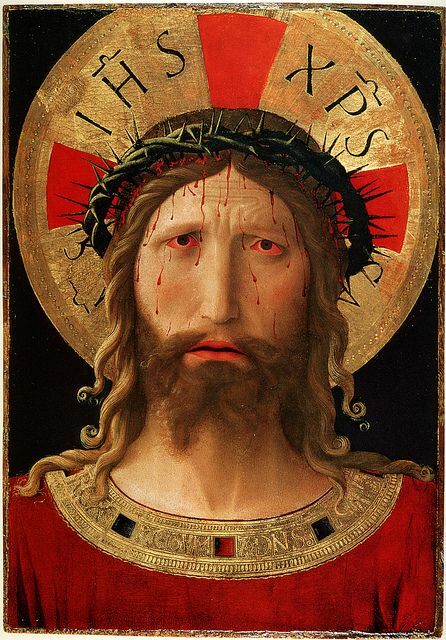 A few years back, I was startled by a face looking out of the marvelous Fra Angelico show at the Met. It is a common enough compliment to say that images are arresting, even when they are not. I can say from experience that this one is. ‪It's right for the day, right for a week that reminds us of murdered innocence and grief for the world. The image also reminds me of painter Makoto Fujimura's essay, "Fra Angelico and the Five Hundred Year Question." It was, you see, inspired by his visit to the Fra Angelico show. The Ranworth Antiphonal, circa 1460-1480. I promised to read and scour The Book of the Red King three times by the end of Lent, and I just might make that finish line. But I have also decided to read it another time afterward, as I've made more changes than foreseen. Well, that's not so surprising, nothing ever being perfect. A mighty long book of poems, the manuscript stakes some claim to being a narrative because tells the progress of the Fool, although in fragments. The sequence includes poems about the friendship between the Red King and the Fool, necessarily an unequal pairing. 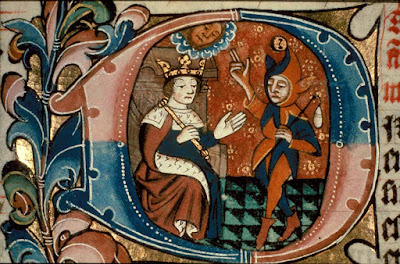 The Fool is consistent, though he transforms, but the Red King's self is unpinned, and it may be one thing in one poem, another thing in another. 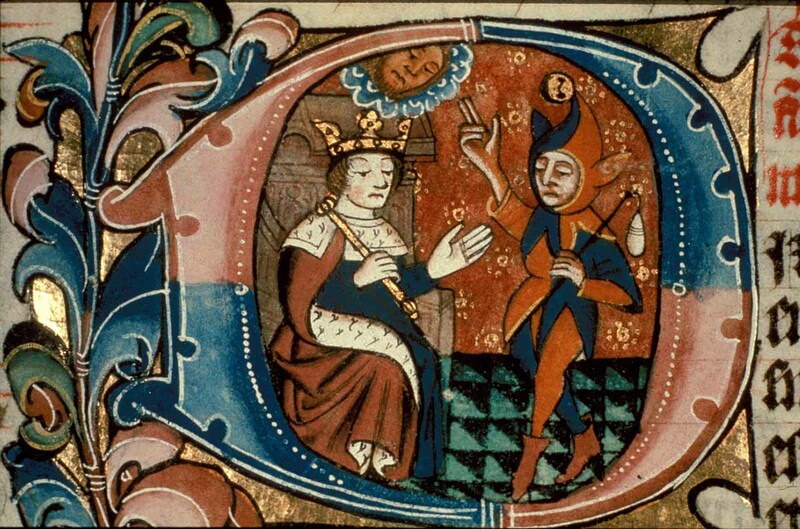 The manuscript also contains a kind of love story about the Fool and his beloved, the Precious Wentletrap. The whole is to some degree governed by alchemical transformation. The story felt transformative in the writing--just swooped out, some years ago, in a great rush. I have off and on tinkered with the poems and am now determined to turn in the book by the end of spring. As in the making of any object that aspires to gold, it benefits from the polishing. 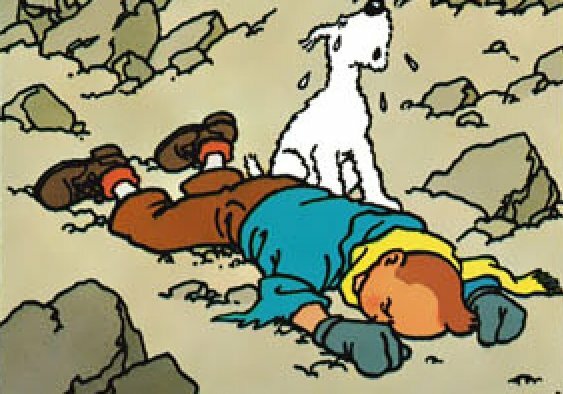 by Georges Remi / Hergé. Could it be Lucas Cranach the Elder? Or is that insane? Thought of "Princess of Saxony" hands. Enough of the You Asked series for the nonce. It's time for I Ask. What was the last thing you read (and the last thing you read and liked), and what are you reading now (or what is in the line-up for next)? New acquisitions this week: the late Christopher Logue's full version of his long poem, War Music: An Account of Homer's Iliad; Annie Dillard's selected essays, The Abundance. 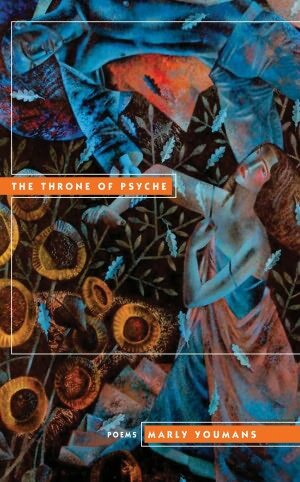 (The only other book of essays I've read lately is Mary Kinzie's The Cure of Poetry in an Age of Prose.) I'm already reading War Music. Prior to this, I've only read the also-titled War Music, a portion of the now-whole, or as close to whole as we will ever have. Last book I listened to was Karen Savage's reading of Jane Austen's Persuasion. It's a LibriVox recording also on youtube as a single listen. I always thought that I liked Persuasion less than the others, but I was wrong. Maybe I'm finally old enough for it. I'm also reading Robert Walser's The Walk (the translation of the revised version) and assiduously looking for the copy of Scott G. F. Bailey's The Astrologer that the naughty person who was going to read it aloud to us has deposited . . . somewhere. It's as if there's a terrible jinx on that book. But it'll be next, whenever found. My misbehaving eyes are better, and I shall read it for myself! I'm also reading some Louise Bogan and Edwin Muir poems. And memorized another Yeats poem. I do want to memorize more. 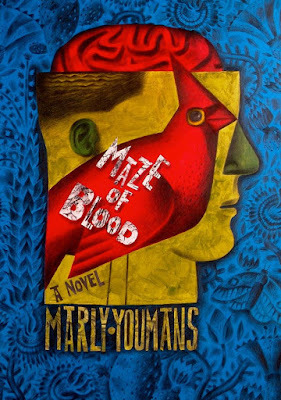 The Maze of Blood page has been revised and updated with clips from new reviews. Forthcoming is a new interview about the book from Suzanne Brazil--up soon! 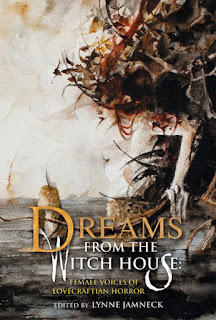 "The Child and the Night Gaunts"
Did I say that I have a small story in the very attractive Dreams from the Witch House? It is an anthology of Lovecraftian tales by women, edited by Lynne Jamneck, and with by Daniele Serra art for every single story. Stories by Joyce Carol Oates, Caitlin R. Kiernan, and more. 1. Bad: reading another writer's post on appealing to readers to post Amazon reviews and realizing once again that I am completely unable to ask (thanks to a large bolus of inherited Southern genteel politeness fed to me in childhood) anybody to do anything at all for me and so am not at all fit for the current material, commercial day with all its marketing liveliness. 2. Good: two talks in Florida in the next year; The Book of the Red King swimming along nicely, though I got stuck on revising "What the Fool Whispered to the Wentletrap" for three whole days and will probably dither over it a bit more; lots of poems coming out here and there, in print and online; lovely requests, even if I'm too busy to fill them; movie bite (though I don't really regard these, as I have been getting them since 1996 without much progress); possible trip to L. A. in June if I wish, and perhaps I do; snowdrops and aconite in bloom. St. Patrick's Day dinner, made by my Irish-Dutch-Akwesasne husband: corned beef, cabbage, salt potatoes, honeyed carrots, Guiness chocolate cake with Bailey's cream cheese icing. Today is my mother's 87th St. Patty's Day birthday. R. T. (Tim) 10:54 AM, March 15, 2016 I'm going to be bold (and I hope not rude) by making a comment (observation) and asking a question. (1) I've known a few poets in the past half century, and I've been impressed by their commitment even though their reading audience seems to be painfully small; (2) How can poetry now in the 21st century ever grow beyond its self-contained audience (usually academics, other poets, and a smattering of others) and become more commonly read by more people? Perhaps neither my observation nor my question are worthy of your attention. I'm just thinking out loud. I want the past--which contemporary scholars are busy ousting from our best schools--to go along with me. Get an English major without a jot of Chaucer, Shakespeare, and Milton? It happens. Spin poetry out of your navel instead of out of the rich gold of the past? Lack a proper humility in standing before the masters? It happens. Little springlike shoots, desires for tradition and its magic and powers are cropping up in all the arts, I expect. In painting, somebody like Makoto Fujimura, painting in the Nihongan traditions, calls for culture care and the creation of beauty out of the ashes of destruction, a gift to the wounded and dehumanized soul. A devoted follower of the Old Masters like Jacob Collins says, “Those people who never lose sight of beauty and power are attractive. I’m trying to make things beautiful in a deep way. Poetic. Transformative. Mysterious.” A good number of my friends who paint, even when they are clearly children of Modernism, have embraced narrative and sometimes figurative work. Many of them seem like bridges between one thing and another, and some have moved (I'm thinking of Victoria Adams in particular) from something near abstraction to an enchanted realism. The great transcendentals, beauty, truth, and goodness, are returning to us in various ways, though there are many who fight against their elemental powers. At times, they feel fresh and alive with energy once more. You suggest that numbers in poetry are a problem. I am not so sure, though it certainly would be lovely to have more readers. Many a press has foundered over poetry's small sales. The "sugar'd sonnets of Shakespeare, among his private friends" were passed by hand (Francis Meres, 1598.) Later on, we know that Donne's poems were circulated this way, as were the works of many others. A small, beautiful work like Chidiock Tichbourne's "Elegy," written before his execution, may well have been dependent upon a single hand-written copy, though the poem soon made it into a book. Poems have survived their times despite small readership. Was there ever a mythical age when all the world knew poetry? Perhaps not since the days of oral recitation by the fire, if then. What can we do? Well, schools could focus more on memorization and recitation and appreciation instead of dissection. (Need a written school assignment? Translate a sixteenth-century sonnet into your own words. Or write a sonnet, and then look at it two weeks later. Time tells all.) But how much needs to be done? I don't even know. I expect we might be surprised by meeting people in seemingly un-poetic occupations who read poetry--perhaps not contemporary poetry, but poetry all the same. Certainly it was not uncommon in the nineteenth century. And today there are elements of poetry in popular slams, rap, song. Do those lead young people on to better work? I have no idea. Maybe not. But I'm not fond of the idea of shoving poetry down people's throats as if poetry were an intellectual castor oil. Makoto Fujimura would say that culture belongs to all of us, and it is our responsibility to share what's beautiful and good. Surely that is true, and one thing we all can do is talk about the poems and books and art we love. I buy art, mostly by friends, and I buy books that I want to support. Often they sit a long time before I read them because I am busy with deadlines, but I buy them anyway because I know a purchase is an encouragement to the writer and an assurance to the publisher. The most destructive thing to a book is, after all, to be ignored. And some degree of that is the fate of most books, poetry or not. How could it be otherwise when only some minute percent of all writers are self-supporting, and when publishers choose and push the lead books of fiction and nonfiction? Perhaps there's some lovely good in the idea that the best poetry, even in its loneliness and neglect, resists the current world where art is an expensive widget often fettered to ideology, where commercialism is god, and where utilitarian pragmatism rules. Perhaps that small, burning lamp--a gift to the world that mostly looks away--will continue to call to itself those who love the high play of language. Perhaps that readership will grow. 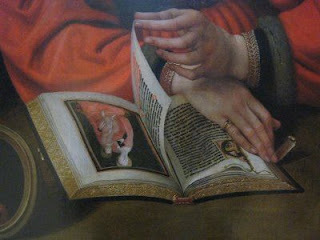 As Mako says, art offers "our dying culture unfading bouquets, gifts of enduring beauty that we do not want to refuse." Poesy as posy: I, too, wonder who will accept that gift, those flowers. 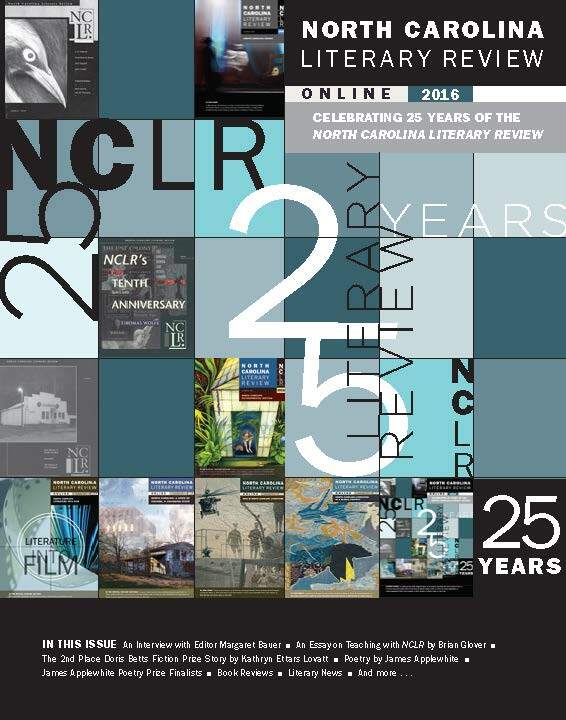 I've mentioned that print journal North Carolina Literary Review is publishing four poems from a manuscript called Rave, originally inspired by the structure, technical features, and subjects of Yoruban praise chant. 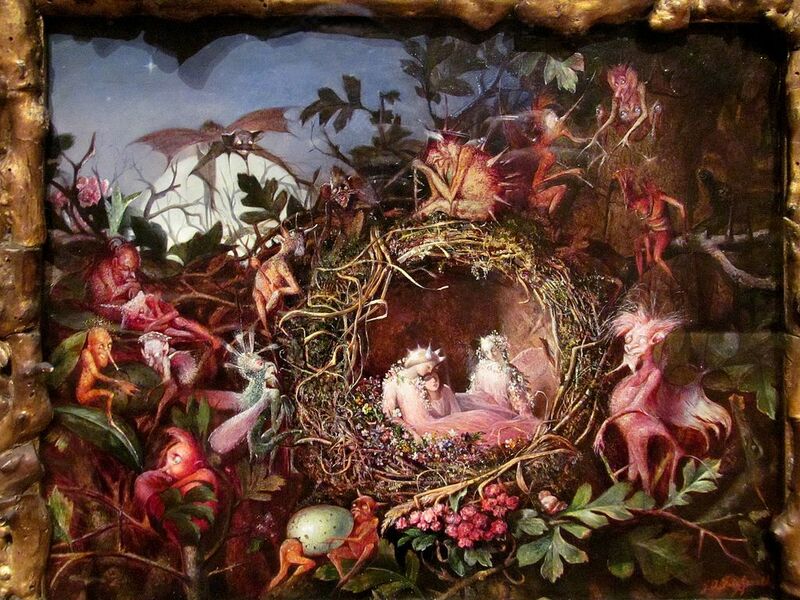 They are "Spring Tree Egg," "Alice," "Night Blooming Cereus," and "She-Who-Changed." NCLR also has an online supplement, in which another of the Rave poems now appears. This one is the first one I wrote--and it was the only for a long time--written during a class of mine at the Antioch Writing Workshops in Yellow Springs a few summers back. "Anniversary Song" is closer than many in the manuscript to the original forms that inspired me. So it was the initial start, the seed that later grew. All five poems were finalists for the James Applewhite Poetry Prize. Click on the Rave tag below for links to more poems from the manuscript. Graham Ward, "Child in Tarifa"
for Graham to use in a future gallery show. I have a few more interesting questions in the Bullington-Youmans interview party but need to take a small break from them in order to push forward on The Book of the Red King, which has been hanging fire for years now. It has been in the condition of "almost" for so long that I was tempted to let it go on being "almost." Luckily, a shadowy sense of guilt at last crept over me, and I am now crawling through the very long manuscript again for the third time in the past month. And I think that I shall be done creeping along when I get to the end this time. I shall, that is, stop. Nothing is ever done, particularly on such a very long manuscript of poems. 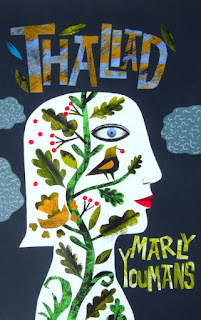 One of the curious things about this manuscript is that thirteen prints and paintings have been made in response to its poems, even though it is not yet out as a book--not even submitted. One of them is by Mary Bullington, and I've posted it several times before. Some came from a poem that has never ben submitted anywhere, written for a friend, who sent it into the aether. Eventually it landed in an artist's inbox and became a seed. What a surprise! I've always thought that a work should, in the ideal, be generative. So this makes me feel pleased. 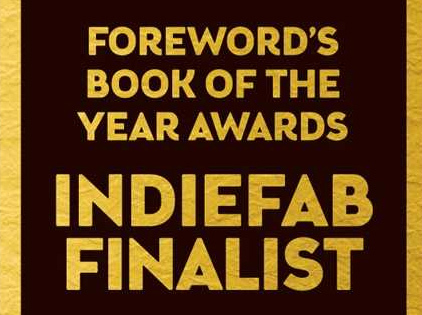 Book of the Year Awards for independent publishing. For clips from other reviews, go here. Congratulations to the other finalists in literary fiction--Barbara Stark-Nemon, Peter Grandbois, Caitlin Hicks, Lindsey Drager, Vanessa Blakeslee, Paula Closson Buck, Ben Nadler, Kathy Giuffre, Suzanne Heagy, Lorraine M. Lopez, Shann Ray, Coleen Kearon, Stacy Barton, Barbara Roether, Elizabeth Harris, and Brian Kindall. Best of luck to their books! 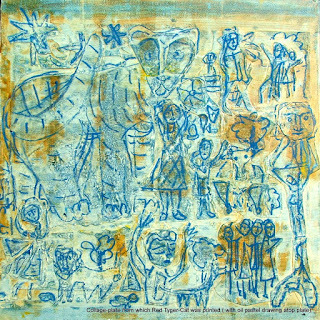 glued on a monoprint of the same collage (2012). In response to a request to interview some of my painter friends, I have been interviewing Mary Boxley Bullington. As she, in turn, insisted on interviewing me, a part of the You asked series is composed of our questions to each other. Soon I'll post an index to our conversations, as well as some information about how to see more of Mary's work, and how to get in touch with her. Please click to see larger images. Note that some pictures are not embedded but at the foot of the post--all pictures mentioned are in the post. To see more of the Bullington-Youmans interview party, click on the appropriate tag at post's foot. To see more of You Asked, do likewise. 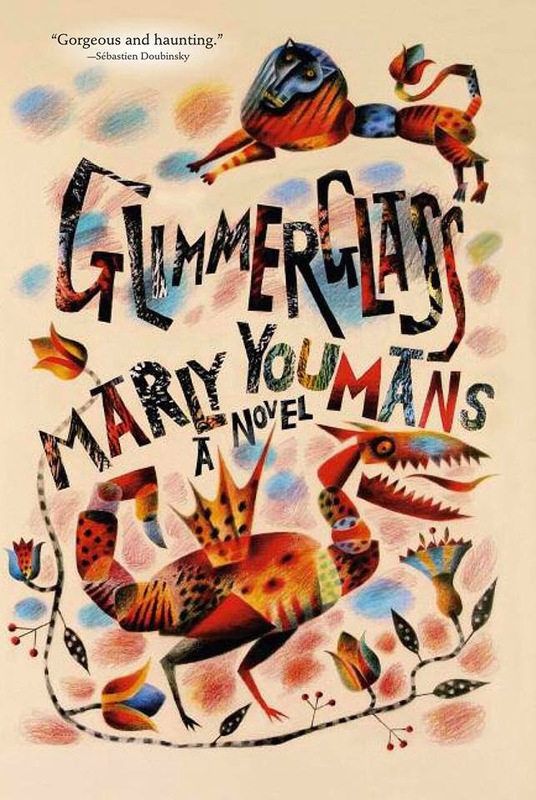 Youmans: As a collagist, you're a follower of a wandering muse, and you often completely revise a collage multiple times before you are satisfied. A visit to your two studio rooms shows that you have a bewildering variety of painted scraps and pieces in baskets and even littering the floor--small catalysts for the imagination. Clearly you often cut up and paint many times before you are finished with a piece. Ignoring for a time the realm of instinct and muse-ravishment, can you describe your methods in a systematic way? 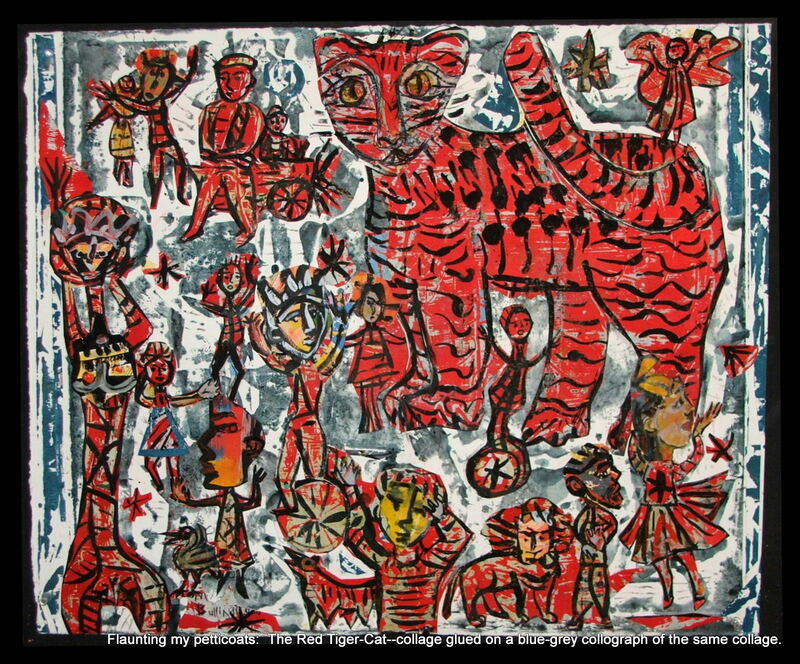 from which collographs of Red Tyger were printed. For me, collage is a very versatile means of invention and of expression. Below are just some of the many approaches to the technique I've used—with images to go with them. 1. Overlap and Layering: Layers add dimension and texture to a 2-dimensional piece. In layering my collages, I consider what needs to be covered from the bottom layer, and what should still be visible. I like to let my petticoats show a bit. 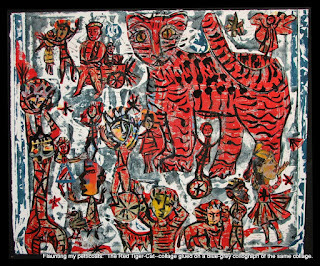 The Red Tyger (2012) is a collage of figures cut from a drawing in India ink, acrylic and black gesso monoprint using an earlier version of this collage as a plate (technically, this is called a collograph). 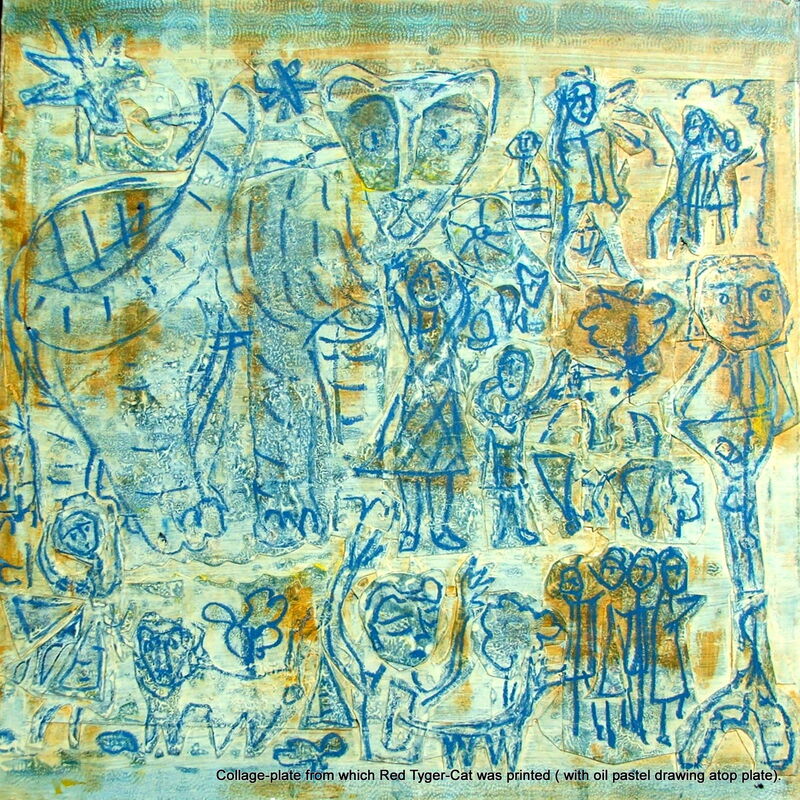 The blue-gray background of the collage is another collograph taken from the same plate. 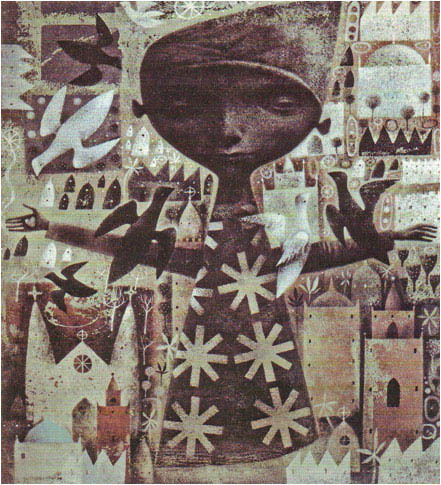 Thus the blue-grey shapes behind the collaged figures act as shadows. A new intensity and vibrancy in my layering of collages emerged in 2015: In my own Voice (Listen) adds one layer of collage over another, with layers of freshly painted pattern in between. 7. Vision and Revision: Finally, collage is a very forgiving technique. It allows me to rethink and revise paintings and even collages that don't quite succeed. Though the number of choices it gives me can be confusing, collaging allows me to save the good, remove the bad, and rearrange the whole. Collage often reinspires a piece that is going nowhere. [See image 6 at foot.] 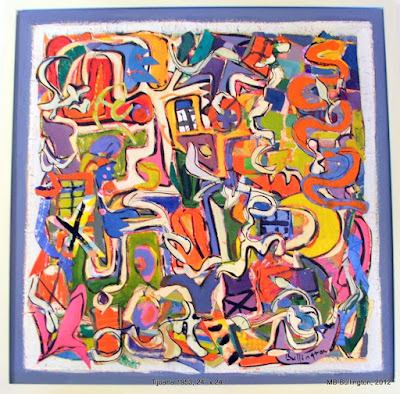 In Tijuana 1953 (2011), I cut up and rearranged an abstract painting I'd spoiled, overlapping and reinventing the elements until they danced. to the pierced painting Flower Filigree." "Pairing Flower Filigree with the 2nd background created visual excitement." 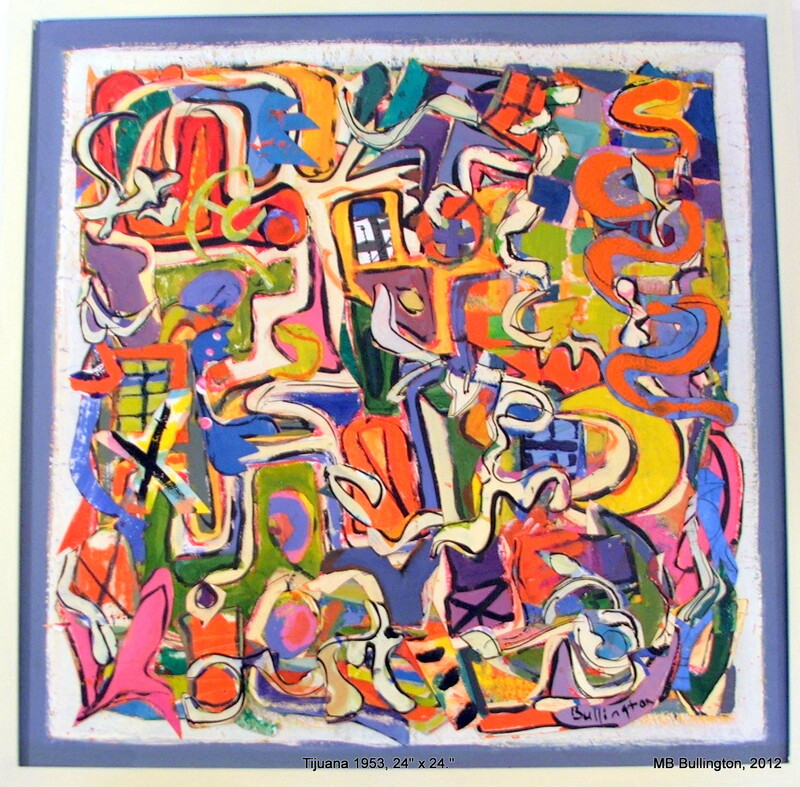 Tijuana 1953, 24" x 24"
"Overlapping the elements until they danced for me." Medallions "repeats yet varies circle & star at least 15 times each." polka dots against patterns and solids. Leaves of Grass before cropping, with a couple of scraps of collage. perhaps, was the big red bird shape." I have a brand new poem up on Autumn Sky Poetry Daily. If you love Yeats, you probably can't miss that it has a formal relationship to "Down by the Salley Gardens." But it's a tricksy poem with something up its sleeve. Here it is: "I Met My True Love Walking." And if you like that one (or don't and are still bold! ), here's another recent one at Autumn Sky: "Landscape with Icefall."